Spring is here, and with it comes the chance to try new things with our clothes, hair, and makeup! To help inspire you and keep you on trend this season, we’ve scoured the runways in New York, Milan, London, and Paris to bring you some of our favorite new looks. Take a peek, and let us know which new look you can’t wait to try! Rainbow shadow. Spring calls for color, and the time for subtlety is in the past. 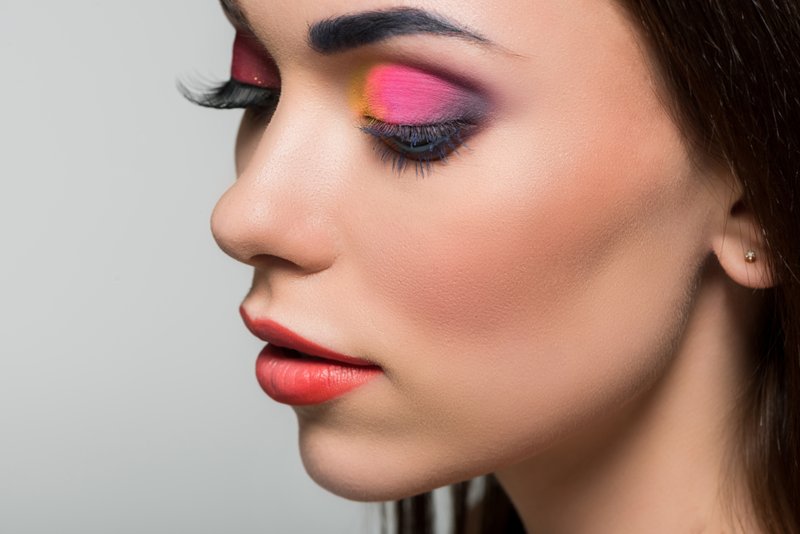 Rainbow dusted eyes embrace the season and bring out your inner wild child. Try the look in pastel shades for daytime, or rainbow-brights for a night on the town. Bold eyeliner. Black and brown eyeliner will never go out of style, but step out of your comfort zone a bit this season and try a bolder look. Retro blue, vibrant violet, or bright fuschia will add an element of surprise and allow your peepers to pop. Monochromatic. Monochromatic makeup is a major show stopper. Beauty brands have dedicated entire eyeshadow, lip, and cheek palettes to shades of the same basic hue to make this trend an easy one to follow. The hottest looks as of late are pinks and peaches for that fresh, spring look. Colorful mascara. Before you try to say you can’t pull this look off- just trust us on this one! Have a little fun with your lashes and swipe on some mascara in any shade other than black or brown. You’ll thank us later! Fresh, glowing skin. Glowing, ultra-hydrated skin is never going away. Let your skin’s natural radiance shine through this season by sticking to lightweight foundations or just a touch of bronzer if needed. The goal is to keep your face looking fresh and youthful while playing up your best features, such as your eyes or lips. Neon lips. Neutral lipstick has seen its day. This year, the trend is ditching lined lips and embracing a less perfect softly blurred edge in bright colors. Imagine how your lips would look after eating a popsicle, and that's the vision to create for spring. Stick to bright corals, fiery reds, or hot pinks, and you can’t go wrong. Are you ready to try out a new makeup look? If so, our team of professionals here at Air Salon & Blow Dry Bar would love to show you how. You’ll leave looking and feeling your very best, and we have three locations to serve you – Mandeville, Baton Rouge, and Covington. Call to schedule an appointment at the location that’s most convenient for you, or use our mobile app to schedule it. You can download our app for free from iTunes, Google Play, or Amazon.